In the recent weeks with the recent heat wave we’ve been having, i’ve naturally been switching up my skincare as my skin often changes a little during the warmer weather and i’ve been reaching for products to keep my skin hydrated and glowy but without looking oily. I thought i’d share a few products i’ve recently been reaching for in the hope it will give you some recommendations if you to are wanting to switch up your skincare. Care for your skin during the warmer weather with these few skincare picks.. When it comes to cleansers all i’ve been using over the past few months is an oil based cleanser and i’ve really noticed a difference in the condition of my skin and also i’ve noticed how much my breakouts have calmed down. One of my favourite ranges has to be The Body Shop Camomile range and I absolutely love both their Camomile Silky Cleansing Oil (£12) and their Camomile Cleansing Balm (£10). Both products I would say are very similar but the formulas are ever so slightly different in sense that one is an oil and the other is a butter with an oil like feel. Both products break down product so well and I find it just melts my makeup away like no other product. I also find they work to add a little bit of extra hydration to my skin and don’t feel heavy on the skin like some cream cleansers can. If you’re on the look out for a new cleanser i’d really recommend checking out The Body Shop as they have so many ranges for different skin types and they’re so kind on the skin. Sticking on the oil based products, one face oil i’ve been loving is the RosehipPlus Oil* (£14.80) which i’ve been using for the past couple of weeks of a night time to add a little more hydration to my skin as the sun often does dry out my skin, especially on my forehead. I do find that you have to use the smallest amount of this as a little goes a long way and just helps to keep my dry skin at bay! On the flip side of oil based products is my go to moisturiser for all year round which is of course the Clinique PepStart Moisturiser (£15) which i’ve featured a fair few times on my blog but has and probably always be my go to. It just works for my skin so well by blurring like a primer would but gives my skin almost an instant boost and smooths over any dry areas that I have making my foundation go on like a dream! Another area of skincare i’ve been taking more care of recently is my hands and the skin around my nails as i’ve found the warmer weather to really be taking a toll on my hands, and due to having acrylic nails the skin around my nails can often get quite dry. I’ve recently been using two products from Flexitol to help combat these two areas and so far i’m really impressed with the results. When it comes to dry skin on my hands i’ve been using Flexitol Hand Balm* (£5.29), which i’ve been applying every couple of days or so all over my hands and I just find it works differently to any other hand cream that i’ve used before. The product itself is unscented and is great for those who suffer with eczema or skin conditions of the same. 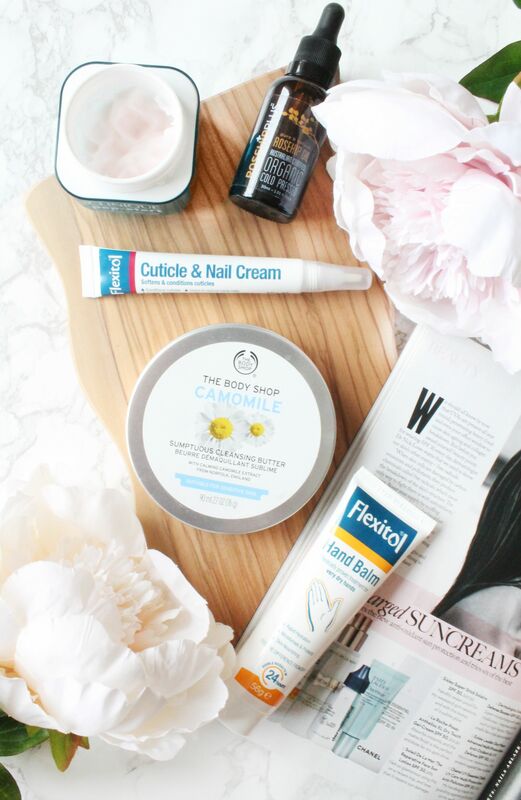 In addition to that i’ve been using the Flexitol Nail & Cuticle Cream* (£5.29) as I find the skin around my nails and my cuticles can get really dry and often irritated, and sometimes the skin needs more than just a hand cream. If you suffer with dry skin or skin conditions that need a little more TLC i’d really recommend checking out Flexitol as they have a range of skincare products for different areas and different skin concerns. What skincare products have you been reaching for recently?